Russelectric announces its new Russelectric Distributed Energy Controller (RDEC). 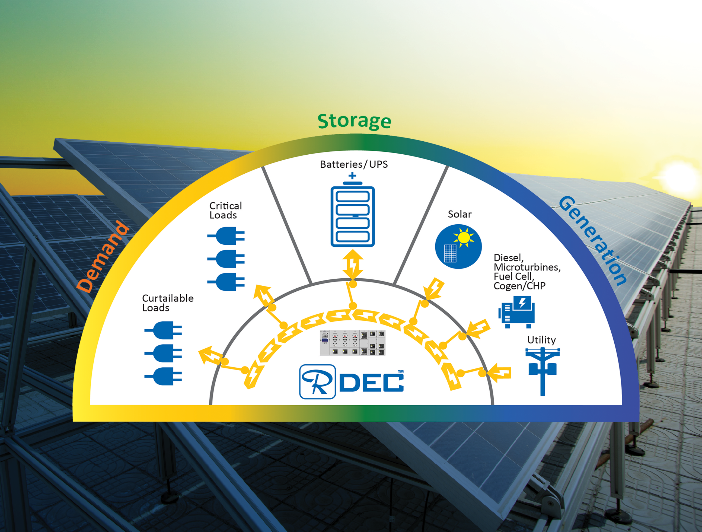 RDEC is a fully integrated controller for complex, mission critical distributed energy systems, ranging from back-up generation and demand management to fully functional microgrids. At the core of each RDEC is the ability of the company’s transfer switches, switchgear, and power controller to provide seamless physical, data, and control integration of a facility’s onsite demand and generation assets. The controller has a number of features that improve business continuity and power quality. Facility integrated solar capabilities, priority-based load shedding, and permitted emissions optimization all enable the controller to provide least cost, least emission business continuity strategies for both short and long duration outages. GTI unveils new website featuring a streamlined design with enhanced navigation. Whether on desktop or mobile, the web presence takes advantage of screen real estate and offers quick and easy access to essential information. Building on feedback provided by customers and employees, the site focuses on better serving diverse audiences with improved functionality and robust content. Visitors will gain a understanding of GTI’s capabilities and how we can help them solve their energy challenges. Rockwell Automation makes security a priority in product development with its security development lifecycle (SDL) approach, which is now certified to meet the IEC 62443-4-1 security standard. The certification confirms that the company product-development processes adhere to the security requirements in the IEC 62443-4-1 standard. The company is now using the certified SDL at all global development locations to support the development of all hardware and software products. Ubisense has announced a new partnership with i2O. The integration of Ubisense’s myWorld platform with i2O’s network monitoring and analytics iNet solution provides water utilities with a new way of identifying issues on the network and assessing the condition of assets on the network. iNet helps water companies manage their networks more effectively. It reduces the time it takes to identify and diagnose issues, removing reliance on customers to report problems. It enables asset maintenance to be done much more efficiently: on the basis of condition rather than time. It reports on network performance and predicts future performance. iNet enables water companies to interact with relevant network insights in context to geography and topography. Danfoss has announced the acquisition of AAIM Controls Inc., located in Waynesboro, Penn. AAIM Controls is a specialized supplier of custom-designed regulation and control automation solutions, from motor starters to complete PLC systems. “We consistently look to strengthen our core businesses by partnering with other successful companies and acquiring technology that complements the solutions we offer our customers. By adding electronic regulation and control automation to our already-extensive portfolio of components for industrial refrigeration applications, we strengthen our global position by becoming a systems provider in the industrial refrigeration market,” said Jürgen Fischer, president of Danfoss Cooling. Evoqua Water Technologies has announced the national launch of its optimized Water One service platform, which enables customers to outsource their water treatment systems and focus on their core business, while the company manages the operation and maintenance of customers’ water treatment systems. Water One is an enhanced service model that combines Evoqua’s water expertise, service and technology with data intelligence to continuously improve customers’ water operation management. Benefits of a Water One solution include: system optimization, predictive and proactive service, and simplified, pay-by-use billing and pricing. Aclara has won a pilot deployment project by the City of Dothan, Alabama for an electricity and water advanced metering infrastructure (AMI) program. Upon completion of the pilot, the city of Dothan plans to first roll out its AMI project to include 31,000 Aclara I-210+ and kV2c electric meters. It will then expand the AMI system to include as many as 35,000 water meters. The project, which will utilize the Aclara RF point-to-multipoint network, will provide several key benefits to the utility and its customers. The Water Environment Federation is pleased to announce Dr. Zhen (Jason) He as the new editor-in-chief of Water Environment Research.